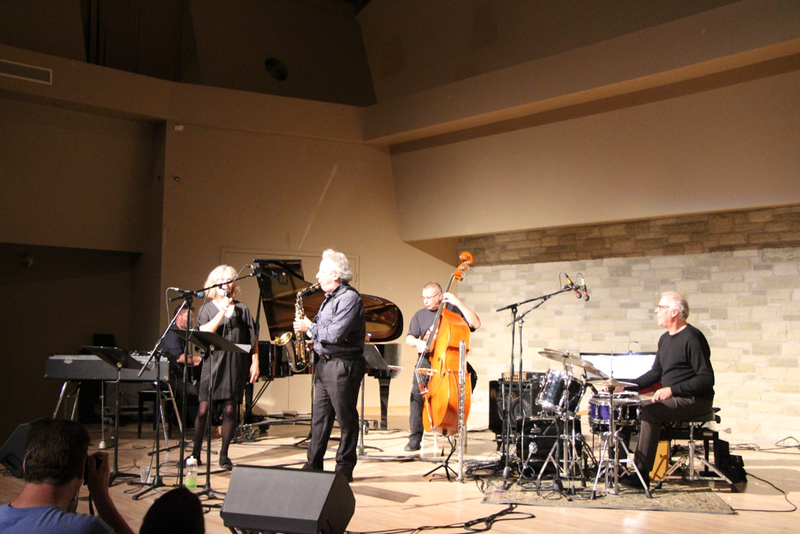 For me, the 25th annual Guelph Jazz Festival opened with a solo set from Spanish pianist Agustí Fernández – a free set on the University of Guelph campus. His music was as elusive as the on-campus parking. 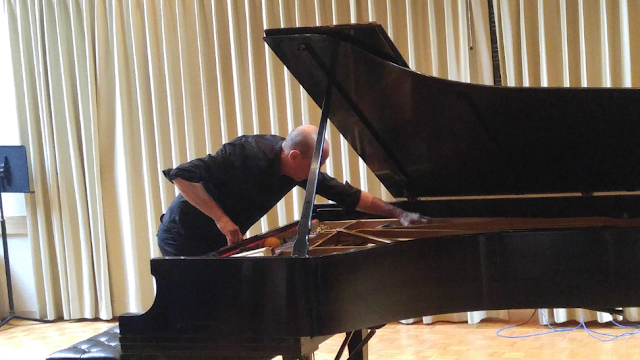 Fernández's improvisation seemed much more interested in the physical properties of the piano than in the sounds that the keys can make (seen above is the performer rubbing plastic toys along the piano's strings while non-rhythmically tapping the piano's frame with his other hand). The small unamplified room seemed a perfect fit for Fernández's music – it was amazing how comfortably the creaking sounds of his stool merged into the sounds from the piano! Although I didn't think to ask Fernández this, it felt like the creaking sounds began as accidental but were soon accepted by the performer and audience alike and turned intentional. In a lot of ways, I think this single action is a perfect synecdoche for Fernández's music. 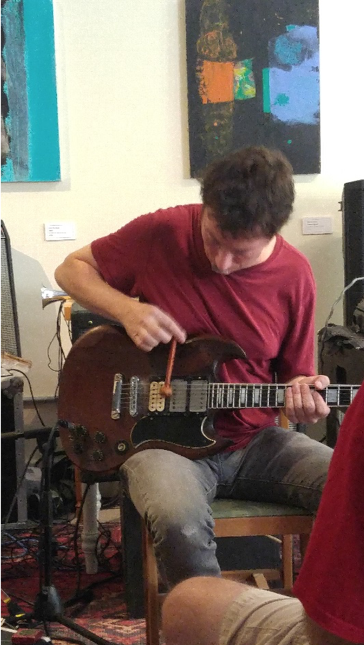 Returning to the music now – the second set I was able to attend was a solo performance by Montréal-based guitarist Bernard Falaise, who built off Agustí Fernández's notion of "talented performers playing their instruments incorrectly" in entirely new ways. Unlike Fernández, Falaise approached his abstractions from an electroacoustic standpoint – utilizing a huge and eccentric set of guitar pedals. Despite his guitar-playing typically looking relatively normal (the attached picture is actually an exception), the clean sound of a string being struck was seldom ever heard. Instead, we heard an array of clunky drones, chopped and mangled loops and pitched jabs of static noise all being beautifully mixed together in a live environment. Listening to, and watching, Falaise play is a real treat – it's incredibly exciting, and inspiring, to see a musician with such knowledge, mastery and comfortability in their own instrument and set-up. 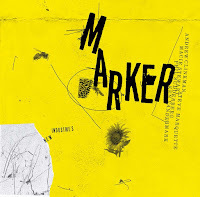 Following up Bernard Falaise in this free afternoon double bill is the acclaimed international European trio Konk Pack – which consists of Tim Hodgkinson on guitar and clarinet, Thomas Lehn on analog synthesize and Roger Turner on drums. 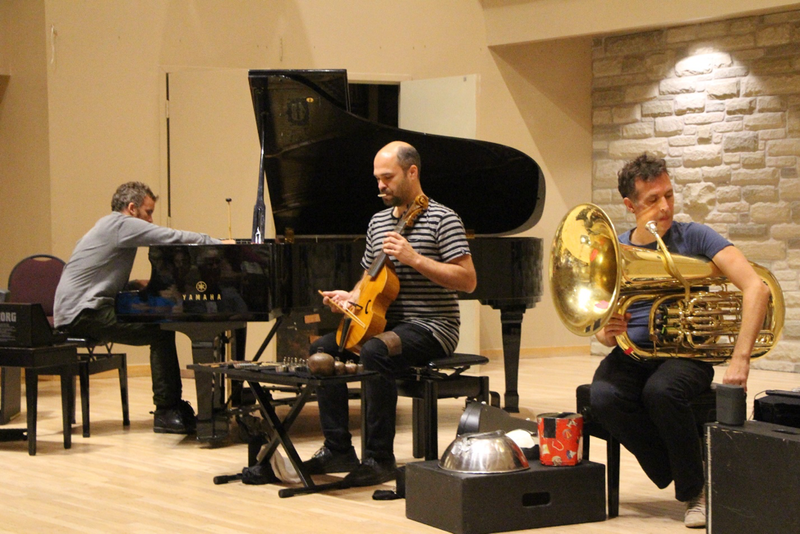 This trio has been playing and improvising together for over 20 years, and that's exactly what they sounded like – their comfortability with each other was astounding. Roger Turner created an outstanding world of sound which came off as everything except rhythmic. The rhythm role was occasionally filled by Thomas Lehn, who's performance was full of baffling synthesized loops and sequences primarily consisting of short tonal blips and jabs of white noise. Tim Hodgkinson's set, especially in the first half, couldn't resist a comparison to the music of Bernard Falaise. While Falaise created his abstractions through electroacoustic processes, Hodgkinson created the same level of abstraction by just playing his lapsteel guitar as is, relying much more on himself than his minimal electronic setup. It was when he brought out his clarinet that I began to realize that this was a musician who transcended simple comparison. Along with vocalist Thanya Iyer, performers Darius Jones and Amirtha Kidambi spoke at a panel where they discussed the importance and the possibilities of the voice within music. Alongside reflections on the passing of Aretha Franklin and the importance of the voice in black music, the three speakers came to some general conclusions about the voice being capable to express emotions and language in ways which are simply not possible for other instruments. The duo set of saxophonists Darius Jones and vocalist Amirtha Kidambi was a clear extension of this thinking. The duo performed a (partially improvised?) composition by Jones, which primarily consisted of the performers sharing and exchanging tones while giving Kidambi moments to speak brief sentences. The performance was so different and enthralling that I forgot to take a picture. Finally, we're at the first paid performance – a double bill which starts with the duo of pianist Agustí Fernández and Montréal-based alto saxophonist Yves Charuest. The show was, sadly, also not photographed. Fernández's performance was considerably different than his solo set – he primarily stuck to the piano's keys, and even played within certain free jazz idioms. That being said, his performance rarely rose above extreme dissonance. Charuest showed off an ambitious and original style, full of personality – his solo improvisation was a strong highlight of the set. 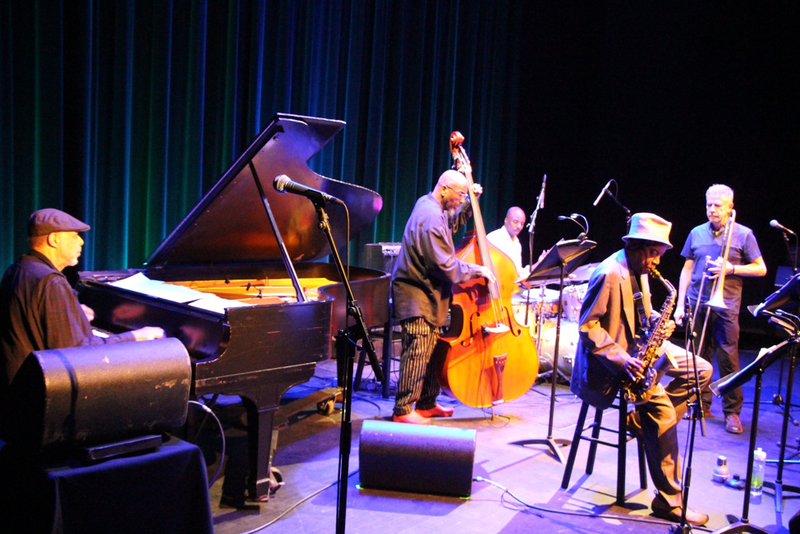 The second half of the concert consisted of a very exciting performance by Steve Swell's Soul Travelers – consisting of Steve Swell on trombone, Dave Burrell on piano, Jemeel Moondoc on alto saxophone, William Parker on double bass and Chad Taylor on drums. Their music, to nobody's surprise, was masterful. Steve Swell's compositions combined upbeat boppish melodies with contemporary abstractions, giving each of the five performers plenty of occasions to demonstrate their individual virtuosities. A highlight of the set was the piano-playing of Dave Burrell, who fans will recognize from jazz classics like Archie Shepp's Blasé, Sonny Sharrock's Black Woman, Alan Silva's Luna Surface, Patty Waters' College Tour or even his own Echo, which was nothing short of childish (in the best way possible) despite his old age. Burrell jabbed at the keys with index fingers like a toddler who's accidentally stumbled into perfect timing. 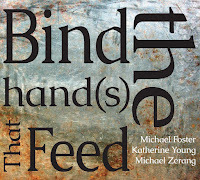 On the other side of the coin we have the comparatively youthful playing of Chad Taylor, who, alongside the rather simplistic and soulful playing of William Parker, did fantastic work at holding the band together. All that combined with the powerful and imaginative soloing of Steve Swell and Jemeel Moondog made for one of the best performances of the festival. 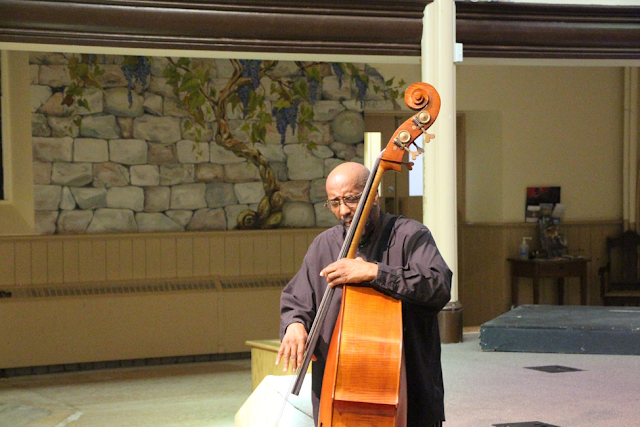 At 10:30am on the next day, we were treated to a solo set by New York City native William Parker in the beautiful Royal City Church. Before his set he told the story of the dream which inspired the music we were about to here, which, not so surprisingly, featured the ghost of Dr. Martin Luther King speaking of freedom – "the next step was to teach the people that everyone has freedom within themselves." William Parker's music feels just as spiritual as jazz legends like John Coltrane and Pharoah Sanders, or more broadly, J.S. Bach – but more specifically, Parker's music pays tribute to African-American heroes and warriors for civil rights rather than any religious personalities. Towards the end of his set Parker begins to clumsily chant, "I'd rather be a human being than to be avant-garde, although the most avant-garde thing you can do is to be a human being". 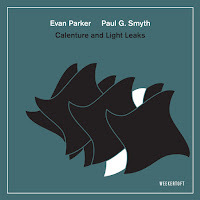 The crowd politely chuckles amongst themselves, surely the reaction that Parker was expecting, but the truth that both the audience and performer knows is that this music is very genuine and very moving in its modesty. Onto our next double bill, we have the trio of Canadians Marielle Groven and Aaron Lumley alongside Dutch guitarist Jasper Stadhouders, who's music is predictably abstract. While Groven spends most of her time leaning over her piano and plucking at strings and Stadhouders rubs odd electronic devices over the back of his guitar, Lumley is left with the task of giving the crowd a relaxing center point through his soft and textural improvisation. When Marielle Groven decides to sit and play the keys her music is surprisingly gorgeous – largely consisting of brief melodies. Groven and Lumley play with great familiarity to each other, leaving Stadhouders as an awkward third wheel. While sounding uncomfortable at times, he does often provide an interesting counterpoint to the other two performers. The other side of this double bill, coming from Tokyo, is Satoko Fujii's new trio of This Is It! This Is It! has come to plug their new CD titled 1538, one of the twelve CD's Fujii intends to release for her 60th birthday in 2018. At the end of the set, Fujii explained to the audience that she decided to title their CD after the boiling point of iron because she wanted to prove that the music was "hot", which I assume to be ironic because the music was anything but – This Is It! played some of the quietest and the coolest, and also some of the best, music of the festival. 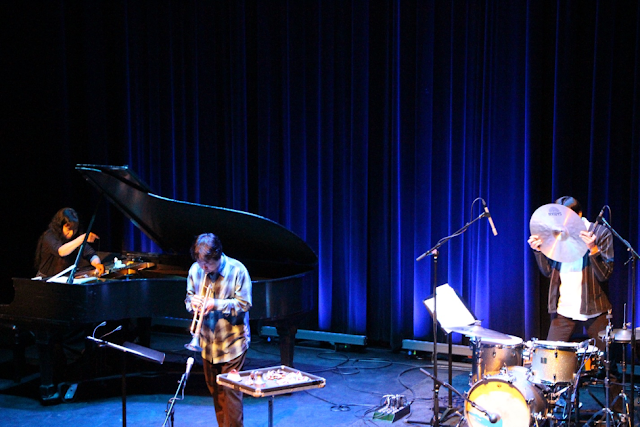 The trio played along to Fujii's open compositions, leaving plenty of open space to let the audience focus on the soft sounds. I think that what most will remember most about the set is the whimsical drumming of Takashi Itani, who Fujii commented was young enough to be her son. Itani performed his quiet experimentations with great humour, even getting occasional laughs from the audience. An example of this is when he was swinging his drumsticks through the air, pretending to drum but stopping right before hitting the drums. He acted nonchalantly and confidently, as if he was actually drumming, but the audience could only hear the sounds of drumsticks through the air. Another example is when he clumsily knocked metal plates off his drums and onto the floor, acting as if he accidentally bumped into them, although the truth was that he was only trying to create the sound of plates falling to the floor. The textural trumpet explorations of Natsuki Tamura were incredible in their own right – he'd cautiously drift back and forth between breath-based experimentations and gently playing along with Satoko Fujii's gorgeous minimal piano licks. Although I wouldn't call the music of This Is It! hot, I'd definitely call it some of the most interesting and unique music of the festival. Up next we have a vocal jazz double bill, which I must admit is not at all my preference. Up first is Montréal-based saxophonist (have I mentioned that festival curator Scott Thomson is a Montréal native?) Jean Derome's ensemble along with vocalist Karen Young performing the songs of Steve Lacy. 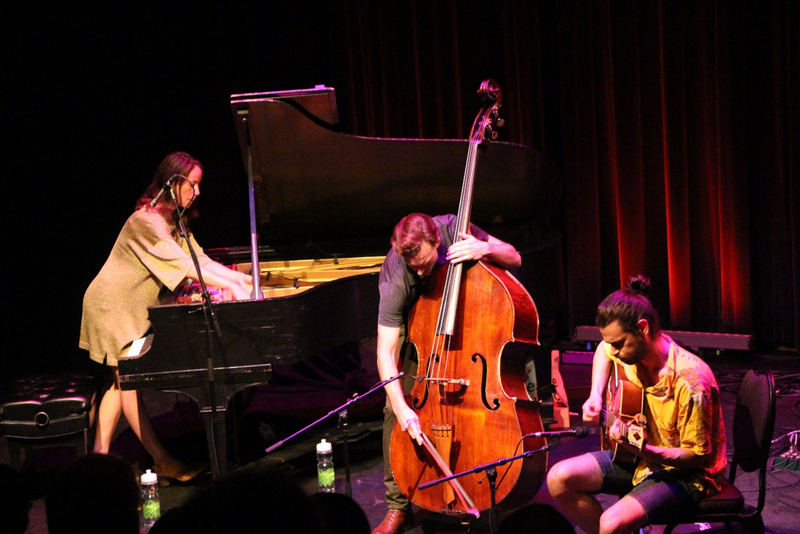 The songs are relatively traditional but made exciting through invigorating performances by the band and Karen Young's beautifully joyous vocals. Pianist Alexandre Grogg is a major stand-out from this set – he slaps the keys with open palms during his improvisations, playing with one of the widest smiles I've ever seen on a performer. It's rare to see so much joy emanating from a performance. On the second half of the bill we have the American Darius Jones Quartet with French vocalist Emilie Lesbros, performing Jones' new suite Le bébé de Brigitte (Lost in Translation). The music here is, unsurprisingly, considerably more experimental than the first half of the concert. Jones' compositions are long and free-flowing, and Lesbros' lyrics combine French and English, calling back to the previous day's panel when Jones confessed his joy for having a singer who will write in a language which he can't understand. 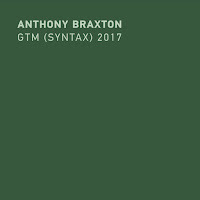 The band is excellent, consisting of Darius Jones on alto saxophone, Sean Conly on bass, John Excreet on piano and Rhodes and Ches Smith on drums. Emilie Lesbros sings with a charm that reeks of post-war Parisian coolness. 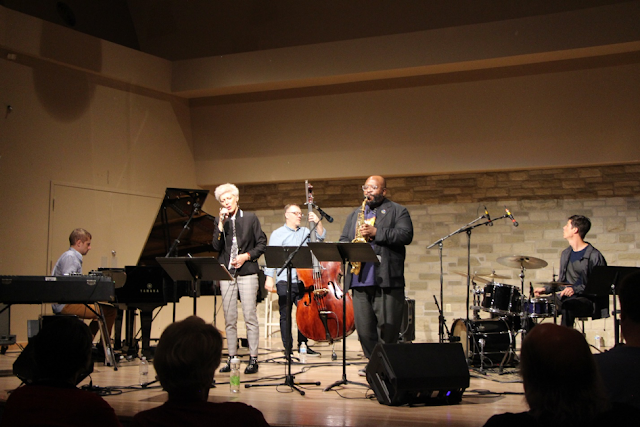 Darius Jones plays in a much more "jazz" style than he did in his performance with Amirtha Kidambi, belting out some fantastically moving solos while also spending hefty amounts of time sitting down and watching his band play. To me, the highlight of the set was Ches Smith's drumming – with his minimal setup he created a seemingly massive world of sound, he sounded as if he was always experimenting and breaking new ground while managing to perfectly follow and capture the songs' rhythms. The first half of the festival's final double bill opens with a set that Scott Thomson half-heartedly refers to as "a soft opening into your Sunday sound-world", surprisingly accurately referring to this beautifully droning set from the international trio of Hübsch Martel Zoubek, consisting of the German Carl Ludwig Hübsch on tuba, the Canadian Pierre-Yves Martel on viola da gamba and harmonica and the Austrian Philip Zoubek on prepared piano. Except for a moment of Martel scratching metal along metal, the music of this trio is soft, beautiful and calm. They primarily play in long and soft tones, making harmonies which flow between awkward and gorgeous. Hübsch and Zoubek have both brought simple electronic setups with them which they use to generate soft tones which combine wonderfully with their instruments. 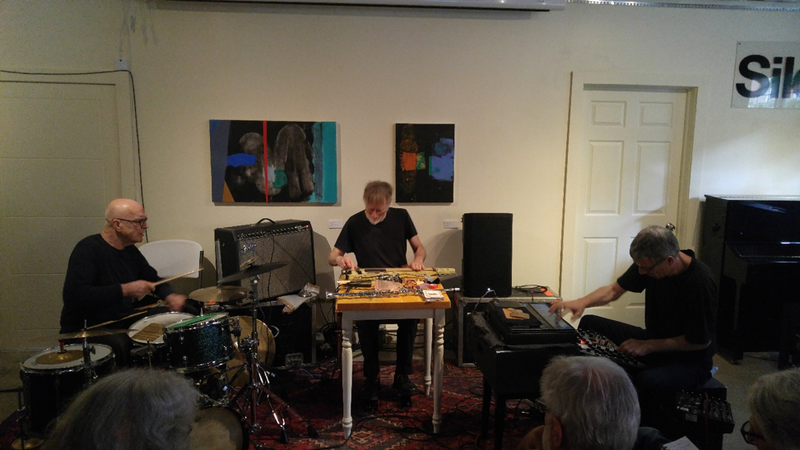 The trio play off each other well, rarely hogging the spotlight and remembering their place as a third of the trio's soft timbral explorational sounds. Finally, we have the Ontario-based duo of Marilyn Lerner and Nicole Rampersaud, which they've humorously titled Brass Knuckle Sandwich. There have been many talented pianists through the festival, but Marilyn Lerner quickly establishes herself as one of the best. Her music is soft but full, she plays out beautiful and calming melodies that sound as if they could be quotes from some of the most talented minimalist or impressionist composers. While listening to her play, it was such a relief to see a pianist who wouldn't stand up and start playing with the strings. That is to say, it was a relief until she started to do just that. 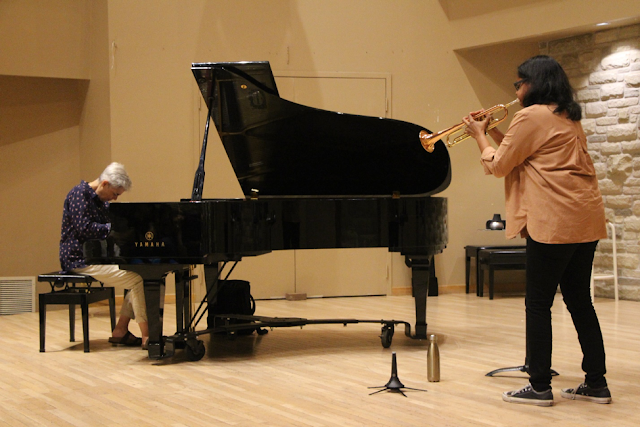 Nicole Rampersaud's trumpet improvisations were wildly different. Her sounds were harsh and timbral, almost sounding like noise music played at a low volume. When listening to her, the reasoning for the band's name becomes obvious. Despite the vast differences in the performer's styles, they merge together well. Well, actually they don't merge together at all, but that's exactly why it works – it gives the audience an opportunity to focus on these two wonderful performers separately – it's like two great solo shows at once! And that brings me to the end of my coverage of the 25th annual Guelph Jazz Festival. I'm stricken with the thought of how lucky I am to have such a wonderful festival nearby, in this small suburban university city. The music is wild and daring, but the audience is all incredibly kind. William Parker, who's played at the festival several times, put it best, which I'll misquote – "Everyone in Guelph is so nice. It feels like everyone here has a PhD." Even without a PhD, I always feel right at home in the Guelph Jazz Festival, and with such amazing music every year I can hardly wait for the 26th. 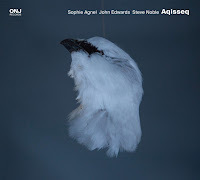 I really enjoyed the performance by Steve Swell's Soul Travelers and also Thursday night's double bill featuring Amirtha Kidambi’s Elder Ones and the Nick Fraser Quartet with Tony Malaby. They were all very good & to my ears exactly as described. My first year but hope to make it a regular event.